After a long winters slumber, Mr Triturus-Newt and many of his amphibian friends were preparing for their annual vacation to the pond for waifs and strays. Mr Triturus-Newt (his scientific name of course) was hoping to find a wife at the courtship dance. The amphibian trail arrived at the pond just as the sun was setting. Mr Triturus-Newt was quickly disappointed by the hoards of amphibians that had gathered at the 5* holiday resort. The place had gone mad, he thought sullenly. He didn’t stand a chance of finding a wife with so much competition. A diving beetle zoomed into the pond, right in front of Mr Triturus-Newt and almost sank him to the ground. 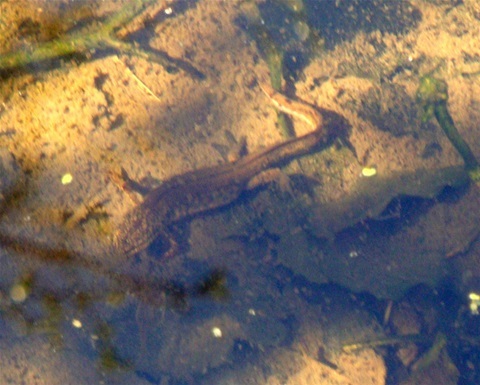 He spluttered and coughed and almost choked had it not been for a beautiful young newt that pushed him to the surface. ‘I had no choice,’ replied the young Newt, ‘you fell on my tail!’ And with that she scarpered. Poor My Triturus-Newt, what was supposed to be a wondered holiday, was turning out to be his worst nightmare. He made his way slowly around the pond, trying hard to avoid the party goers, though he knew if he wanted to find a wife, then he had to join in. The dancing began and so did the whipping, waving and fanning of tails. Mr Triturus-Newt just shook his head in disgust. No way was he going to do that. He would go without a wife if that was the case. But then something happened that made him change his mind. As Mr Triturus-Newt was about to go to bed, he saw a beastly dragonfly larvae, zoning in on the very newt that saved his life. ‘Nasty thing,’ he thought and acted very quickly. He saved the beautiful young newt from being attacked. ‘You saved my life,’ she said coyly. ‘Let’s dance!’ said a very happy Mr Triturus-Newt.